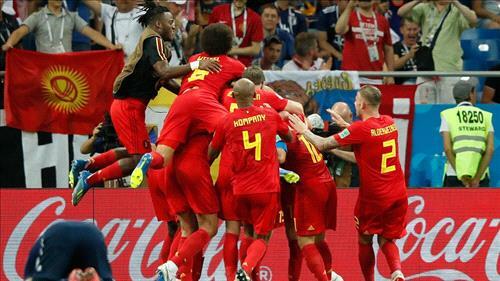 AMMONNEWS - Belgium fought back from two goals down to beat Japan 3-2 with an added-time goal from substitute Nacer Chadli on Monday to set up a World Cup quarter-final with Brazil. The first side to recover from a two-goal deficit to win a World Cup knockout match since Germany beat England 3-2 after extra time in Mexico in 1970, Belgium were run ragged by a Japan side solid in defense and willing to probe deep. As Belgium, 58 places above Japan at third in the FIFA world rankings, came out for the second half and soon found themselves trailing to strikes from Genki Haraguchi and Takashi Inui. But defender Jan Vertonghen made up for the error that cost the first Japanese goal, tucking away a looping header in the 69th minute and the towering Marouane Fellaini pulled Belgium level in the 74th, less than 10 minutes after coach Roberto Martinez threw him on in place of the frustrated Dries Mertens. With Japan pressing for a winner, Belgium broke free in injury time and striker Romelu Lukaku dummied for the ball to run free to Chadli who slammed home the last-gasp winner.